Fancy TV Channel is delighted to announce the nominees of its EPRA, Leadership and Entrepreneurial Awards 2018 judged by the independent experts. 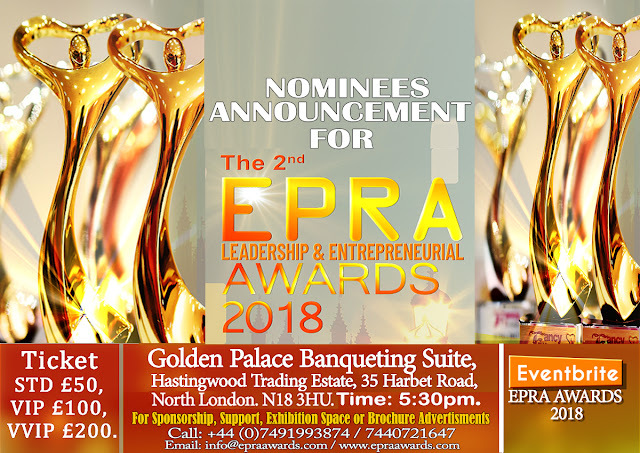 EPRA Awards is a social forum design to accord due recognition's to professionals celebrating the academic achievement, success stories of true leaders and entrepreneurial. The awards provide precisely the right environment for these corporate leaders to inter- mingle and share their experiences therefore providing valuable insight on particular aspects of the business world. Another major objective of this event is to facilitate the development of future business leaders by providing opportunities for its guests. This prestigious event will have in attendance top business leaders and government officials, community leaders, Nollywood and Hollywood celebrities, personalities from all works of life. We will appreciate your donations towards the event and all proceeds from the awards will be deployed to Fancy Foundation Trust acquisition skills project. Join us on Friday 20th July 2018. Red Carpet Starts Time: 5:30pm. Main Event: 6:30pm. Venue: Golden Palace Banqueting Suite, Hastingwood Trading Estate, 35 Harbet Rd North London. N18 3HU. STD £50.00, VIP: £100.00, VVIP £200.00. For Sponsorship, Support, Exhibition Space or Brochure Advertisements. Exhibition is a perfect place to showcase and demonstrate your new products and services. EPRA Exhibition shows are open to smart businesses or organisation that need buzz exposure on their products or services; Being involved in a trade show or exhibition can provide you with opportunities to branch out to business-to-business trading and create a customer database from the visitors to your display booth. Hurry to book while time last.